Ahead of the Park Cameras 2017 Canon Lens Day on 4th March in our Burgess Hill Store, where you'll be able to see every currently available Canon EF lens all in the same place, we're delighted to announce that we'll have a special guest appearance - the rare, the legendary, the huge Canon EF 1200mm f/5.6 L USM super telephoto prime lens. Here's a quick history of this significant Canon lens. 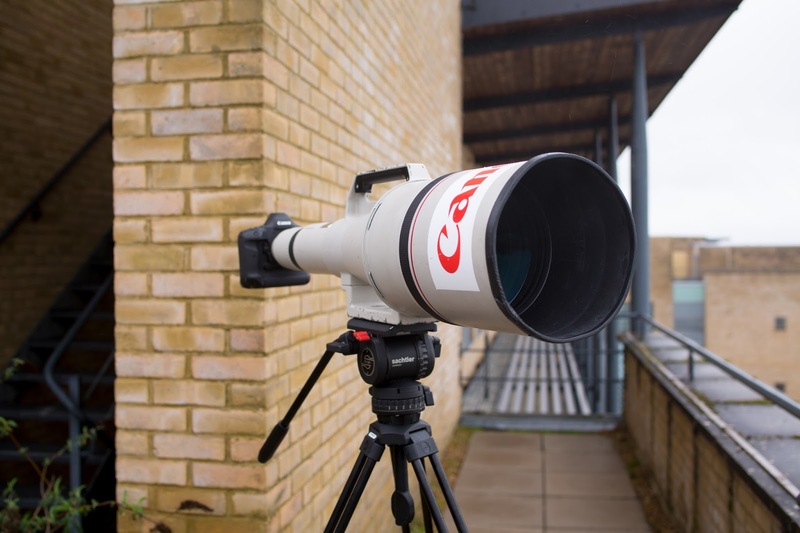 Although the official release date of the Canon EF 1200mm f/5.6 L USM super telephoto lens was 1993 - when they were first publicly available for sale - a number of these lenses were actually made nearly 10 years earlier. Just in time for the 1984 Los Angeles Summer Olympics, five prototypes of this legendary lens were shipped for use by media photographers in order to capture the games. 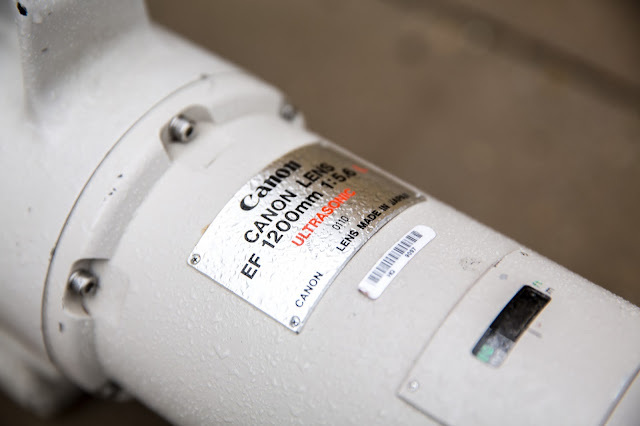 The knowledgeable Canon buffs amongst you will realise that the Canon 1200mm is an EF mount lens, but the EF mount wasn't introduced until 1987. That's because originally, the 1200mm was fitted with a Canon FD mount. 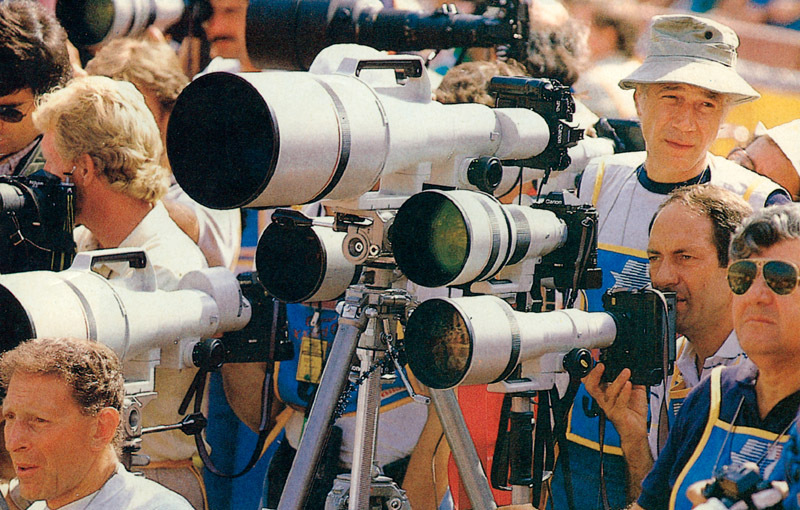 After the 1984 Olympics were over, the lenses were all shipped back to Canon in Japan and, in the early 1990's converted to EF mount and made available for public sale in July 1993. The original FD-mount prototypes included a built-in 1.4x teleconverter, seen here in this rare photo showing not one, but two Canon 1200mm f/5.6 L USM's in the same image, both with the odd, oval shaped teleconverter. This made the effective focal length 1700mm at f/8. It's rumoured that only 20 were ever made, although even Canon themselves admit that they don't actually know the true number. Only three of these beastly lenses have come up for public sale in the 21st century - one sold for 120,000 USD in 2009, one was on sale for £99,000 (approx. 165,000 USD at the time) in 2014, and one sold for 180,000 USD in 2015. The lens consists of 13 optical lens elements, including two exceptionally large artificial fluorite elements. Canon report that the lens took nearly 18 months to construct, partly due to the growing of the fluorite crystals, which reportedly took a whole year to grow. It's impossible to source spare parts for the Canon 1200mm f/5.6 L USM, which means that if you own one and it is damaged beyond simple repair, the only way to get it back working again is to wait for another one to break beyond repair and to cannibalise parts from the two lenses to make one working lens. Unless, of course, you happen to know someone who can precisely machine parts you need. No-one really knows how many versions of the lens are still in existence, although a number of articles point to several Canon Pro services around the world still owning theirs. Other owners are alleged to include Sports Illustrated magazine and National Geographic magazine, as well as a number of spy agencies around the world. If you'd like to see this huge lens up-close and personal, alongside every single Canon EF lens that's currently available (as well as a few rare examples! ), head down to the Park Cameras store in Burgess Hill on 4th March 2017 for our Canon Lens Day. Luckily for me, Park Cameras are just up the road. I'll be there! It would be interesting to see what this lens could do in a side by side test against a current day 800/5.6 with x1.4 and a 600/4 with x2.Unfortunately I'm in Manchester so am not able to pop in to try. Will it fit on my Brownie 127 please?